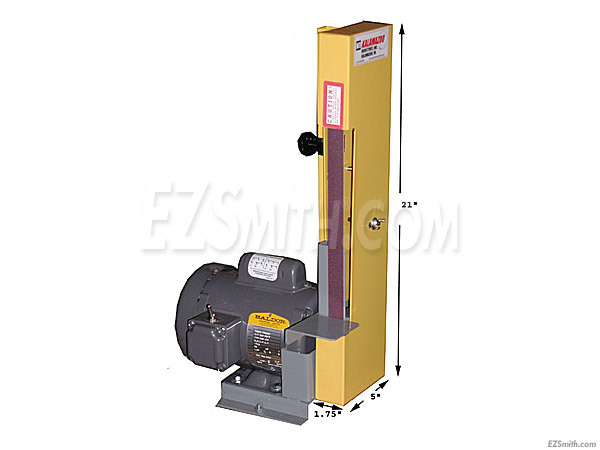 The Kalamazoo 1SMS 1 x 42 inch grinder is the perfect choice for pro level kit building. It conserves valuable shop space with a small bench footprint while performing all the vital tasks of professional knife finishing necessary for clean knife making results. We have $2000+ dollar dedicated grinders in our shop, yet the 1SM (above) is used to complete most of the custom knife works that we create, before it leaves our door. Sometimes, "overkill is not what you need". For high level finishing work or all-around kit construction tasks, this is the perfect choice! Combined with our (Horizontal Finish Attachment) and the (Horizontal/Vertical Swingplate Assembly), this kit building grinder/finishing system will generate the best results "for the investment" in the kit building industry! The 1SMS is identical to the 1SM with the addition of a full OSHA approved safety guard.